Are you ready to experience ear-pummeling sound without smashing your budget to bits? 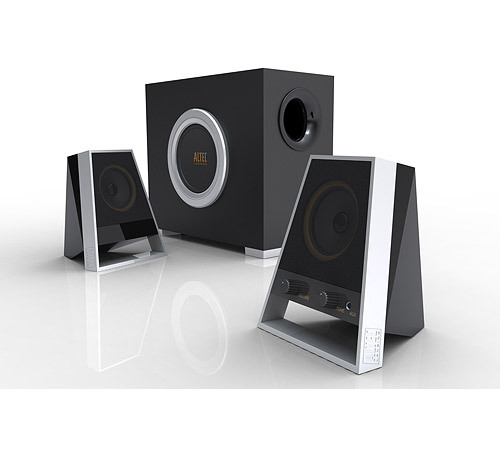 Delivering a big sound wrapped in a small package, the Altec Lansing VS2621 Computer Speaker System is sure to be the perfect audio set-up for your home computer or MP3 player. Offering improved audio dynamics, this three-piece speaker system features a uniquely angled shape to both of it's speakers that is made to direct full-spectrum audio towards the listener. It's bone-crunching bass is enhanced by a set of side-firing subwoofer pumps. With simple-to-use controls and a secondary jack that will allow you to directly connect your MP3 player, the Altec Lansing VS2621 Computer Speaker System is sure to offer you the ultimate audio experience.